Arrive at the Ahmedabad airport/railway station and get transferred to your hotel. Start your city sightseeing with a visit to the Siddi Saiyed Mosque (considered the cultural symbol of Ahmedabad). Then proceed to visit the Sabarmati Ashram ( the house where Mahatma Gandhi had stayed for 13 years and from where the historic Dandi march had begun). 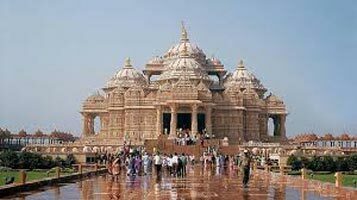 In the evening, visit the exquisite Akshardham temple. Attend the light and sound show (own expense) and return to the hotel for an overnight stay. Arrive at Ahmedabad railway station/ Airport and drive all the way to Jamnagar (6 hours approx). Visit the Bala Hanuman Temple known for its non-stop Ramdhun (non-stop chanting) since 1956 and is mentioned in the Guinness Book of World Records. Also, visit Lakhota Museum, Lakhota Lake and other famous temples of Jamnagar and later explore the local markets in Jamnagar known for their Bandhni work. Overnight stay at the hotel. After an early breakfast, drive to Dwarka, which is about 3 hours from Jamnagar. Arrive and check-in at the hotel. Later, visit the Nageshwar Jyotirling Temple, Gopi (the believed venue of many Raas Leelas of Lord Krishna) and take an exhilarating ferry /boat ride to the holy Island of Bet Dwarka. On your way back, visit the Rukmani Temple. Attend the evening aarti at the Dwarkadhish Temple. Overnight stay at the hotel. Early morning attend morning Aarti (optional) at Dwaka Dheesh Temple, later after breakfast leave for Somnath- which is about 5 hours away. En-route visit Porbander-the Birth Place of Mahatma Gandhi. 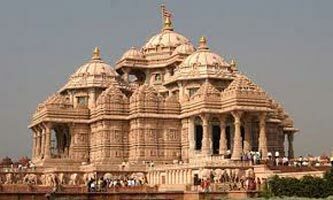 In Somnath, visit the renowned Somnath Temple. It is suggested that you attend the evening Aarti and witness the spectacular 'sound and light show' in the temple premises (own expense) Somnath Temple premises. Overnight stay at Somnath/ Veraval. Today, drive all the way to Ahmedabad, which is approx 7-8 hours. After arriving in Somnath, check-in at the hotel for a comfortable overnight stay. After checking out from the hotel, get transferred to the railway station/airport for your return train/flight.